It's the Ghostbusters Ecto-1 and Ecto-1A from the ever-popular 1980s movies starring Dan Aykroyd and Bill Murray Ghostbusters and Ghostbusters 2, now in model form! It's your choice; you can make the Ecto-1 vehicle from the Ghostbusters movie, or Ecto-1A vehicle from the Ghostbusters 2 movie since this awesome model kit comes with decals and accessories for each vehicle, either way, you're getting a sweet piece of the movie to make all for yourself! 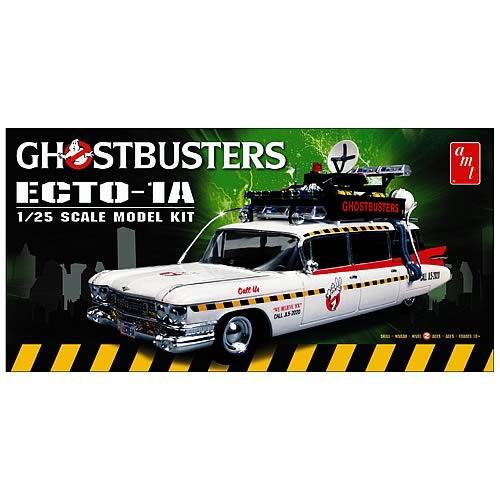 Made to look exactly like the suped-up Hearst vehicle from the Ghostbusters movies, this Ecto-1 and Ecto-1A Model kit is perfect for Ghostbusters fans who are model builders at skill level 2, as it requires both paint and model cement, but you can handle it! Ages 10 and up.